It may not feel like it, but in so many ways, it is a small blessing to learn of your baby's condition during your pregnancy. 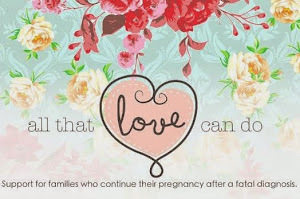 Consider the thousands of women every year who lose their babies at the end of their pregnancies with no warning. Though I know it's of little consolation, the CTT experience gives you the time to prepare for different possible outcomes including saying goodbye to your baby. There isn't much I can tell you, or much that you can do, to take away the pain you're going to feel if your baby dies. For me, personally, the experience was a lot more painful than I thought it would be, but at the very least it wasn't shocking and I felt prepared. I was able to stay calm and the day of my son's birth was peaceful, even joyous at times. Though there were plenty of tearful moments, there were also smiles and laughter. I can't promise the same for you, but everyone who I've met who carried to term, has described some sense of peace and joy on the day their baby was born. I will always be grateful for those 10 weeks I had to prepare myself for the possibility that my baby would not survive. 1. Talk to others who have CTT'd or read stories about women who have done so. 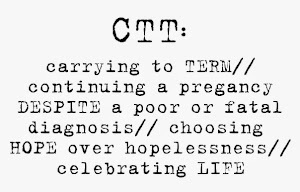 There is a BabyCenter forum here specifically for women who have chosen to CTT despite a poor or fatal diagnosis and a lot of the members, are willing to share their personal experiences. This is something that really eased my mind. Knowing that other women went through what I was going through and ended up having a peaceful birth experience made me realize I could too. 2. Ask questions and seek answers. Try to ease some of your fears, whether you are worried about childbirth, or holding your baby after he's died, by talking to those who can help. Family members, friends, your doctor, and other women who have CTT'd are people you can turn to. I was afraid I wouldn't be able to have a natural childbirth because my baby was breach (and I wanted to be completely lucid and able to hold my baby), but all of my doctors told me there was no reason to think I would need a C-section or drugs that would impair my consciousness. Also, I read stories of other women who had successfully delivered their breach babies, and it gave me hope that I could do the same. 3. If you haven't done so already, you may want to consider getting a 2nd opinion from another doctor about your baby's condition. If possible, try to find a specialist or someone who works in maternal-fetal medicine to see if there are any treatment options. Also, your perinatologist or OB can arrange for you to talk to a neonatologist to discuss your options if your baby is born alive. You may also want to do your own research. Nowadays there is information available online for almost every condition. Getting 2nd opinions and doing research will save you from having any feelings of regret later on. Though there may be nothing you can do, being proactive will save you from feelings of "I could've done..." or "If only I had done..."
4. Pray. There may be nothing doctors can do for your baby, but you can still have faith in God. When I finally accepted the fact that my baby's condition was incurable by modern medical standards, I found comfort in turning to God. Logically I knew that God wasn't going to descend down from Heaven and arrive in the delivery room to save my baby, but I still felt a little better when I prayed. I told God that I wanted Him to do what was best for my baby, and that I would accept whatever His plan was as long as my baby was okay. It comforted me to believe that someone greater than me understood why my baby had to die, even if I couldn't understand it myself. that you can later read to your baby when he's born. You may find writing to be very therapeutic and helpful in working through your pain. I find that it brings me closer to my son and it keeps his memory alive, but it also helps me to work through the tornado of emotions that I'm feeling. 6. You and your husband (or you, your husband and doctor) should sit down one day and write up a birth plan so you are both in agreement ahead of time. Your birth plan will need to take into consideration your baby's specific condition and you may need to do some research or talk with your doctor to determine the best plan for you. Some women decline pain medication in order to be lucid and physically capable of holding their babies. Some women choose C-sections in cases where labor may be too stressful for the baby. Some couples choose comfort care, while others choose life support. Having a birth plan will help ease some of your worries leading up to the birth and will give you an idea of how the day will go. 7. Keep hope alive. There is nothing wrong with hoping that your baby will survive no matter how poor your diagnosis is. I had hope until the second the doctor confirmed my baby's heart had stopped. I realize now that hope was the only thing that got me through each day. It gave me the strength to take care of myself while pregnant and to continue to take care of my baby. Having hope doesn't mean you're in denial. Hope means that you've accepted the possibility of death, but that you're also embracing the possibility of a miracle.